Endless Daze Festival is the brainchild of Psych Night, a group of five like-minded music lovers from the Mother City, Cape Town. Since 2012 Psych Night, in collaboration with Vans, has provided a platform for bands to showcase their wild and wonderful sounds to audiences around the country. Synonymous with a unique and immersive experience with high quality production these shows have become not-to-be-missed events! 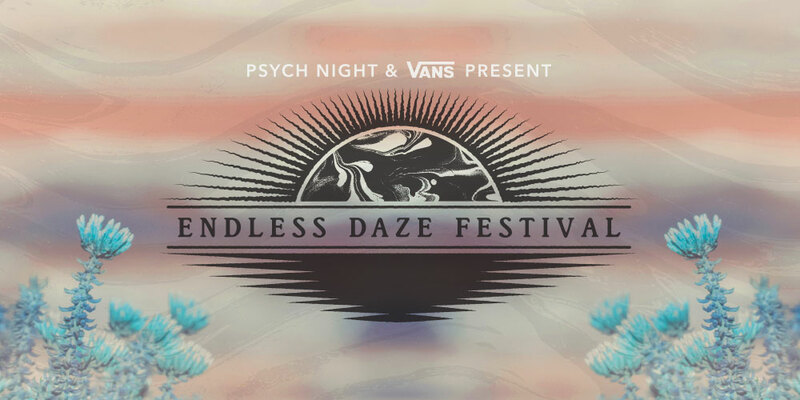 With four successful international tours, namely Night Beats (2013), Golden Animals (2014), Allah-Las (2015) and the Black Lips (2015), 14 international shows and numerous local satellite events Psych Night and Vans are Proud to present their first festival experience – Endless Daze. Only full weekend pass tickets available. No single day passes. Minimum 10 people per campsite, please be considerate to others regarding space. Power points available at sites. No parking of vehicles in campsites. The venue has limited parking capacity and a vehicle levy will be implemented. Car-pooling is strongly encouraged! Motorcycles are an exempt from this levy. All income from the vehicle levy will be donated to Silwerstroom reserve for the planting of trees. Please make sure all valuables and belongings are taken out of your vehicle. DO not leave anything in cars. The Organisers will not be accountable for anything taken from your vehicles or any damage sustained to your vehicles during the course of the festival. Please drive safely and do not drink and drive. There will be a fully stocked and licensed bar in the main festival grounds. The Bar opens at 11AM and closes at 2AM. You may bring your own alcohol though it will not be allowed out of the campsites and into the main festival grounds. Food trucks & stalls will be providing breakfast, lunch and dinner over the course of the weekend. Vegetarian and vegan friendly. No use of cooking facilities such as braais, skottels and/or gas stoves. No fires in the campsites. Limited card facilities will be provided. We advise bringing cash to avoid disappointment. No fires & no gas braais, cookers or skottels. Participation in the event is entirely at own risk. The organizers accept no responsibility whatsoever for injury, death, loss or damage of any nature to persons, vehicles or belongings, even in the case of negligence. Due care has been taken to make this event safe and secure. Tickets are non refundable.